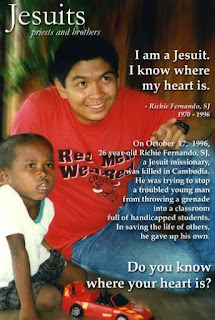 On October 17, 1996, twenty-six year old Richard Fernando, SJ, a Jesuit missionary was killed in Cambodia. He tried to stop a troubled young man from throwing a grenade into a classroom full of handicapped students. In saving the life of others, Richie gave up his own. Richie Fernando was a young Filipino Jesuit missionary in Cambodia. He was sent to Cambodia before his priesthood. There, he worked as a teacher in a technical school for the handicapped. In the school, people who were disabled, most especially landmine victims, learned skills which help them earn a living. Richie loved his students in Cambodia and allowed them to share with him their stories. Among Richie’s students was Sarom, a sixteen-year-old boy who was a victim of a landmine. He wanted to finish his studies there but he was asked to leave by the school authorities for his disruptive attitude. According to Richie, Sarom was tricky but he still had a place for him in his heart. On October 17, 1996, Sarom came to the school for a meeting. Angered, he suddenly he reached into a bag he was carrying, pulled out a grenade, and began to move towards a classroom full of students; the windows of the room were barred, leaving the students no escape. Richie Fernando came up behind Sarom and grabbed him. Sarom tried to let Richie go, but the missionary held on to Sarom. Sarom accidentally dropped the grenade behind Richie, and in a flash, Richie was dead. The missionary had protected Sarom and the other students from the violence that was about to come. Shocked by what he had caused, Sarom sat in his jail cell and mourned too. In March 1997, Mr. and Mrs. Fernando wrote to Cambodia's King Sihanouk, asking for pardon for Sarom; somehow, someone had to stop the violence. Sarom had not wanted to kill Richie. “He was my friend,” he said.